This is one of those posts that I’m not sure if anyone would actually care to read, but what the hell. It’ll count towards Blaugust. Then we played some Super Smash Bros Melee, another game that I hadn’t played in forever and forgot how to do pretty much everything. I did remember that the hammer was awesome though and tried to snag it at every opportunity. Eventually my brother joined us and there was a lot of control trading as there were only two available. Despite having not played it for a long time either, my brother is still better than me at playing Melee. I think it might be because I’m more used to 3D environments than 2D. 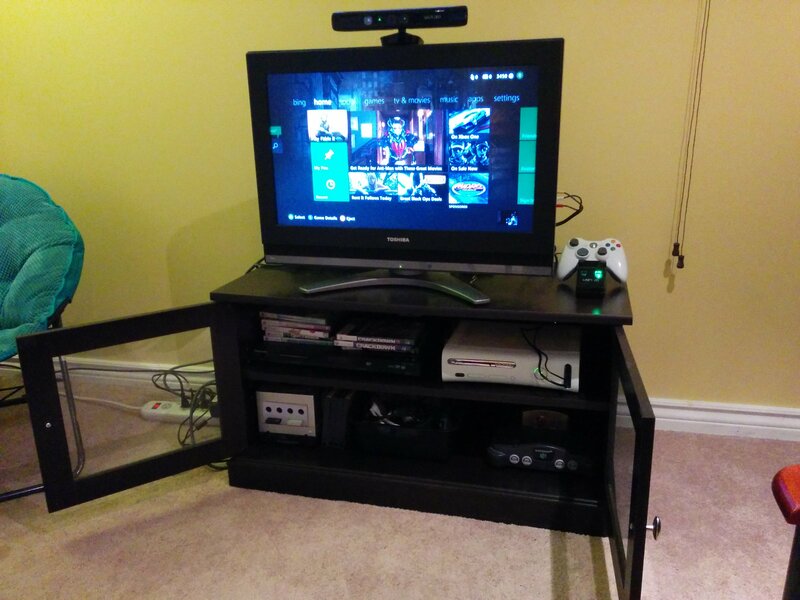 When Lord Crumb went home, I was left with two consoles lying around and cables everywhere, including a 100-foot network cable stretched out between the Xbox and my router in my bedroom downstairs. Since it’s hard to vacuum with so many cables around (my dog sheds a ton), I set to organizing and cleaning it up. I found an old power bar and started organizing all of the cables through the inch-wide hole in the back of the TV stand. Between the Xbox, the Gamecube, and the pre-existing N64 and DVD player, I’m fairly certain that it’s not possible for me to fit any more cables through there. I also found my brother’s Kinect sensor that he wasn’t using so I attached that as well. And at Lord Crumb’s recommendation, I bought a Venom Twin Charging Cradle for my controllers. I haven’t done any serious gaming to fully test it, but I really like how easy it is to just pick up the controllers and then settle them back in the cradle when I’m done. I also have a nice black controller but it’s not shown here in the picture because I’m using it. Then came time to deal with the cable. 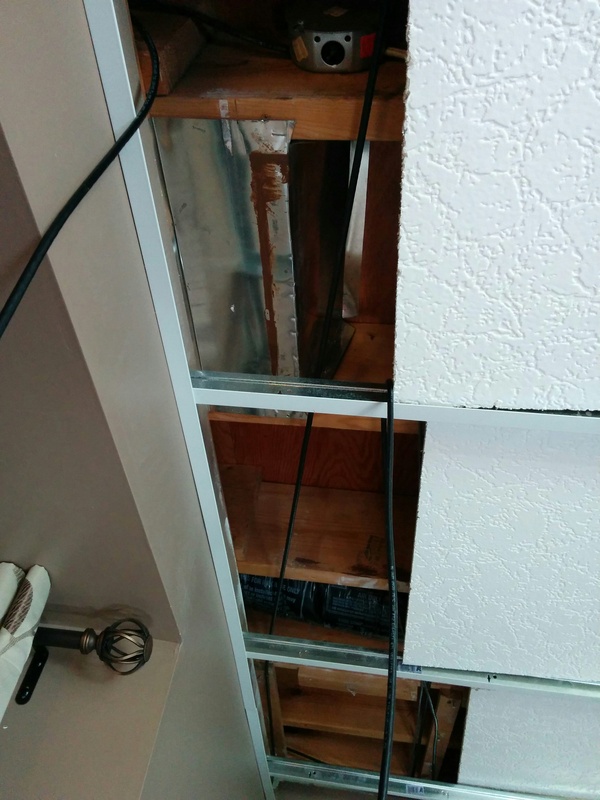 The beauty of living in a basement is that the ceiling is just made of ceiling tiles and cables can be run above it. I’d never actually done that before, but I figured the best way would to be to shift aside the tiles where I wanted it to run, loop it through the rails, and then move the tiles back. Easier said than done. There’s one point where the ceiling is not in fact tiles and I discovered when I got to it that it had too small of a space to get the cable through easily. So I ended up running it over top of the bathroom ceiling instead, which has a larger gap for some reason. To do so, I needed something I could fasten the end of the cable to so I could guide it to the other end. 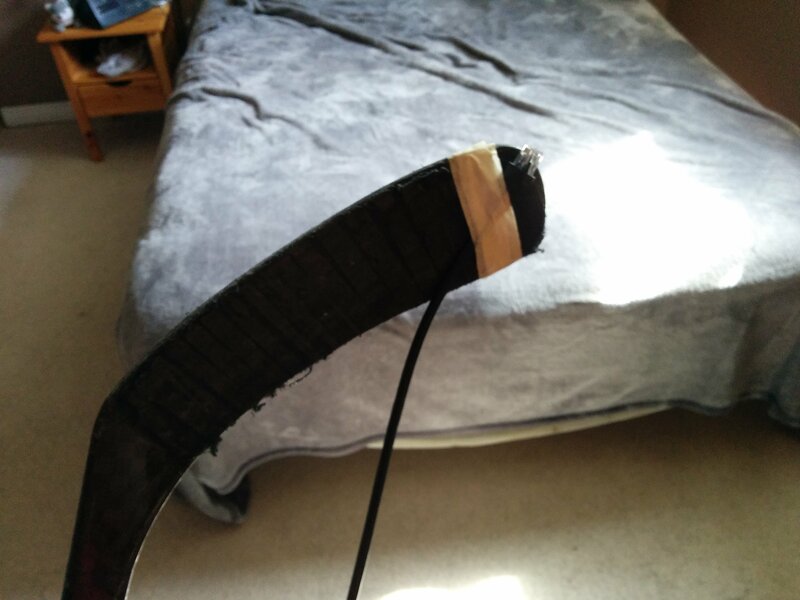 I was very disappointed when the hockey stick I found was not long enough. I’m in Canada, damnit, hockey sticks should always be helpful for me. An extra long piece of spare tile railing did the trick instead. I had to squeeze around the furnace and water heater to finally get the cable to the Xbox but I accomplished my goal. Let me tell you though, I had no idea that so much crap could break off the edges of ceiling tiles. Even though I wear glasses, I had to stop every third tile to get stuff out of my eyes, at least until I learned not to stand directly underneath the edges. It took a lot more work and time than expected but now I won’t have to do that again as long as I live in this house. And now I’m all set up to play some Xbox co-op games with Lord Crumb one day. I even picked up Crackdown 1 & 2 and Gears of War 1 for a couple of bucks in the US just so we can play them together. Who knows, maybe I’ll even be able to finish Fable II now. Unless you have a capture card, I don’t think it’s possible to take screenshots on old consoles. When I want to, I usually just take a picture with my cellphone. It won’t be great quality but your point will get across. That’s too bad, I bet they’re not on the cheap side either. Oh well, just another reason to stick with PC games whenever I can! Honestly with a decent camera or cellphone, it’s not too terrible. I use phone pic screens on my blog on occasion. A clarification: The Odroid (C1 for anybody interested) wouldn’t stream using Steam directly due to being based on an ARM processor and the Steam client currently won’t run on this. That said, we don’t really know yet what’s going to be in the Steam Link hardware and there are rumours that this could be ARM based too, so we may yet see that work. We did get the Odroid to stream using Nvidia’s own system, GameStream, and an open-source piece of hardware called Moonlight (formerly LimeLight) that we were able to install on the Odroid, but this is dependant on your host machine using an Nvidia card. Ah that’s right, I had forgotten about that. Moonlight did seem to freeze on us every once in a while though, I don’t know if that was the hardware’s or software’s fault.